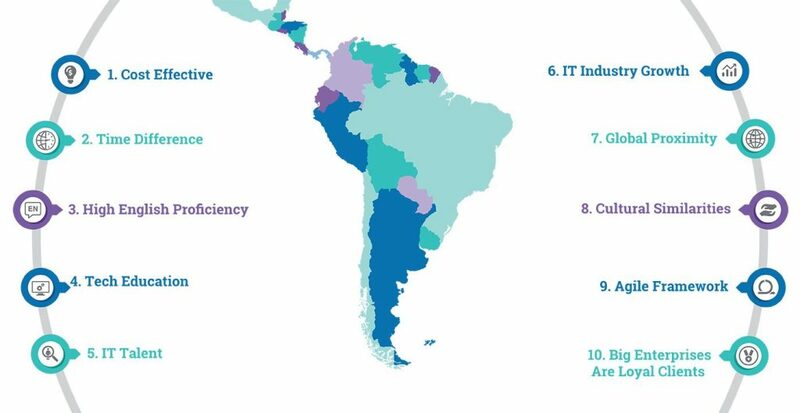 In Latin America, Software Outsourcing is the fastest growing industry with Argentina, Brazil, Colombia, and Chile leading the way. The global IT outsourcing industry is forecast to grow at a CAGR of 5.84% over the period 2015-2019. There’s a growing need for skilled IT talent that the United States just can’t meet. Reportedly, in 2020 there will be 1 million more jobs than candidates globally in computer sciences fields. As a result, the best option to balance out the supply and demand is to outsource to Latin America. Outsourcing development to U.S. contractors can cost anywhere from $80 to $150 per hour, while outsourcing to Latin American contractors can cost between $40 to $70 per hour. Outsourcing hubs like India have a large time change from North America, making it diﬃcult to work on real-time projects. In Latin America, there is just a small 1-3 hours diﬀerence (ET), so brieﬁngs and project management are much faster. According to the EF English Proﬁciency Index 2017, some Latin American countries have overtaken India and China in language proﬁciency and all of them are climbing in English level, with Argentina at the region’s top. Your company can take advantage of bilingual developers and project managers. Argentina, Chile, and Brazil are the most highly-educated countries in Latin America. Argentina’s government program Plan 111 Mil plans to educate 100,000 new programmers in the next four years. Stack Overﬂow provides numbers showing that there are more skilled programmers from Peru (24k), Colombia (21k), Chile (18k), Argentina (16k), and Brazil (14k) compared to other global IT hotspots like India (13k) and China (13k). According to a study by Frost & Sullivan there are so many successful companies providing outsourcing services that the IT industry revenues in Latin America have grown by 20.3% between 2016 to 2017. To continue reading, download our PDF.